In an age where most camper trailer manufacturers are trying to impress with enormous canvas proportions and loads of extra inclusions, Drifta has gone the other way. The new Drifta Offroad Tourer (DOT) doesn’t have a half-acre of canvas, big tare weight or stainless-steel cooker/kitchen, but it’s this very simplicity that sets the camper apart from the pack. 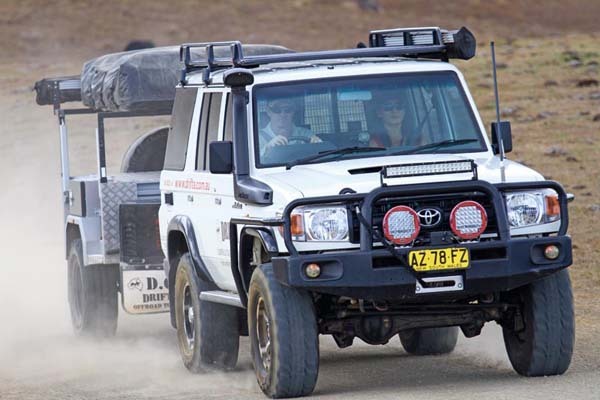 The new Drifta offroad Tourer from Drifta Camping & 4WD is priced at $20,990 and is marketed as just the ticket for a travelling couple, or even a small family. It has a truly fast set-up and pack-down time; there aren’t many campers that really achieve this. Sure, the DOT does miss out on a few things due to its easy set-up; it doesn’t have huge living space or sleeping room. But Drifta views this minimalist approach as the way to happy camping: the easier it is to use, the less stressful and more enjoyable your camping adventure will be. 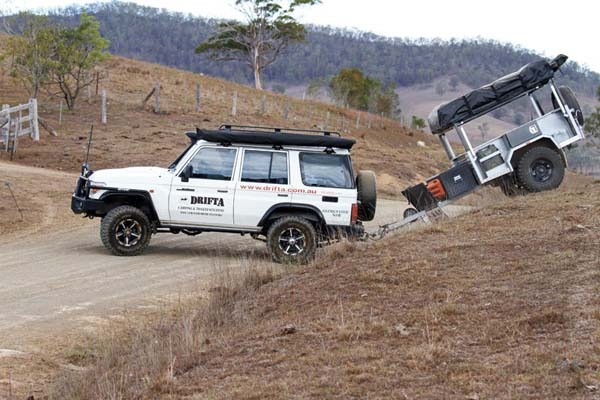 The Drifta offroad Tourer trailer measures 1.82m x 1.22m. 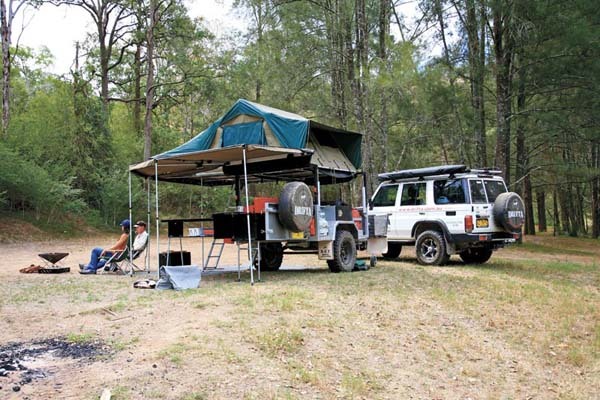 It comes with a roof-mounted tent that rests on a framework raised 300mm above the trailer-top. 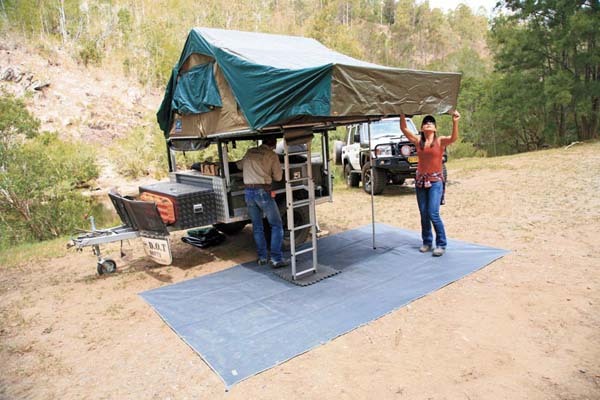 This creates space under the bedbase to carry supplies, while still allowing you to reach the tent relatively easily. This also keeps the centre of gravity quite low while driving offroad. 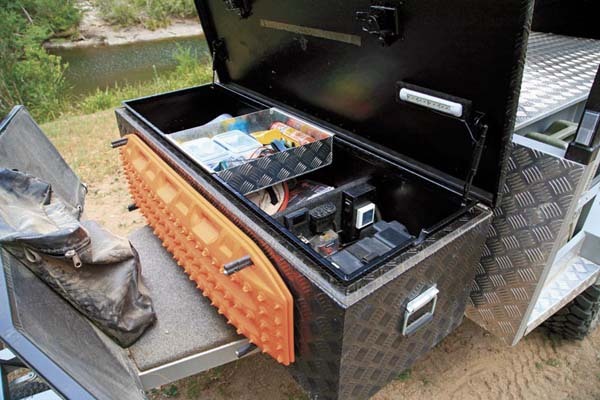 Once you’re ready to set the tent up, however, the whole thing lifts even further via a set of four 12V electronic linear actuators, which source their power from the trailer’s toolbox-mounted 125Ah battery. This extra height allows the trailer’s tent and separate awning to achieve enough head clearance for even the lankiest adult. Each actuator is able to lift 75kg and hold up to 500kg, so it can easily take the weight of a small family. Personally, I’d like to see longer-travel actuators to make the most of this great idea. As it is, you still need to stand up on the trailer guards (or ladder) to fully access the tent during set-up, so being able to lower the tent even more would make this system more effective. 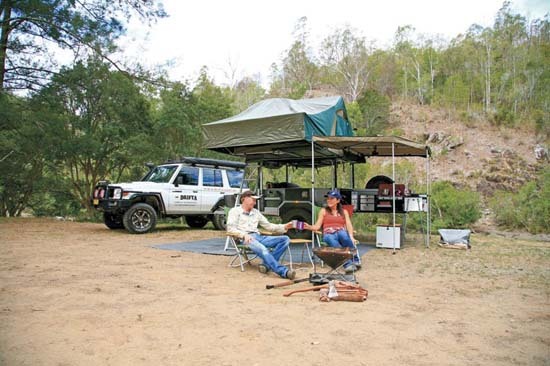 Drifta has chosen a Hannibal roof-mounted tent to complement its campers. The unit included with the DOT is a ‘Drifta Special’, measuring 2.0 x 2.4m. The tent features a boot storage shelf, three-stage pole system to support the awning, removable PVC cover, reverse-opening side windows and custom adjustable ladder. The trailer itself is jam-packed with LPG bottles, jerry cans, 12V water pumps and toolboxes. 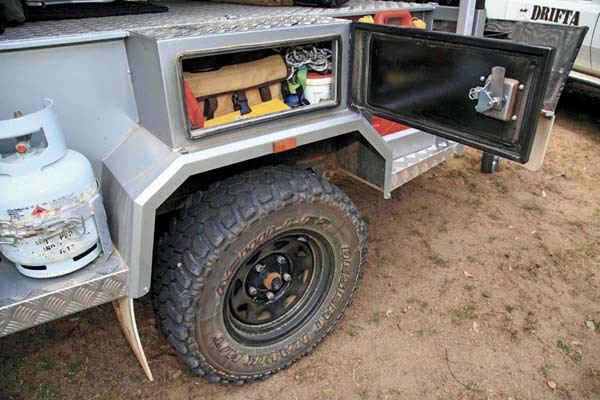 An OzHitch offroad hitch is used to mate the trailer to your vehicle. A full-frontal mesh stone deflector and underslung mud flaps help minimise stone damage to the trailer’s silver-painted finish, though I do say ‘minimise’ and not ‘prevent’, as some stones will always find a way through the barrier. The trailer has electric drum brakes and runs on the ever-reliable five-leaf suspension. 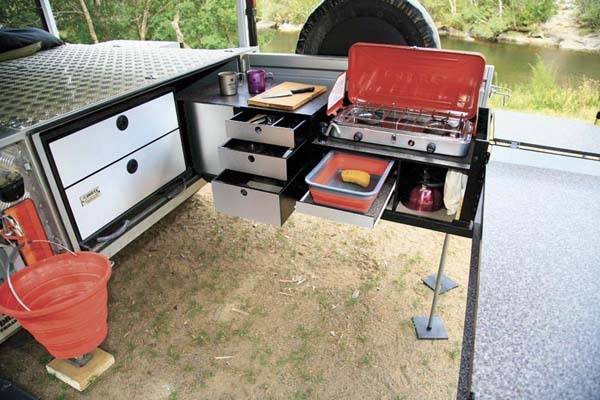 As you would expect from a Drifta camper, one of the company’s famous slide-out camp kitchens has been included, which allows the trailer’s internal space to be used to the full. The timber unit is treated with a classy ‘stainless-look’ veneer finish. Collapsible buckets and tubs serve as a kitchen sink and handbasin, while a manually operated hand-pump draws from the underslung 80L water tank (or from a jerry can placed under the sink). 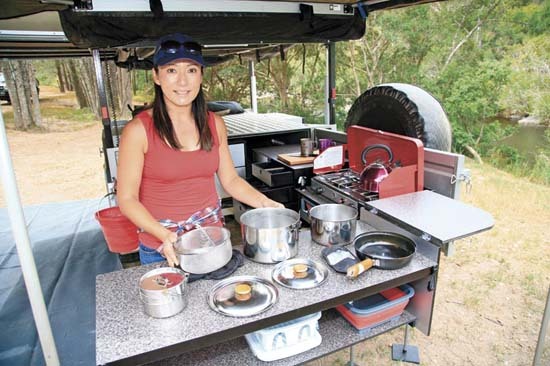 A simple two-burner cooker is suitable for knocking up most culinary delights while on the road. There isn’t a lot of undercover protection from the sun or rain, but Drifta do provide extra side walls that clip onto the Hannibal tent and rear awning for a little more protection. All up it’s still no match for the all-encompassing canvas units common to other campers, but that’s part of the DOT’s appeal — quick, easy and lightweight. 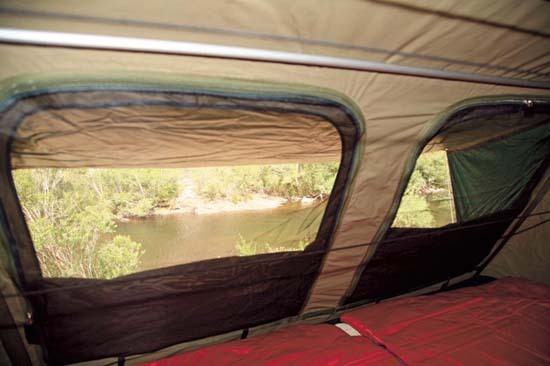 Cleverly, the separate awning can be used in conjunction with the tent, or set up separately. It’s a swing-out affair that just covers the opened kitchen and provides a little covered sitting space. Again, it’s not huge, but simple and quick. All up, the DOT camper offers a small footprint, can be set up nearly anywhere — even on muddy or wet ground — and is perfect for those wanting something easy to use without any extraneous bells and whistles. 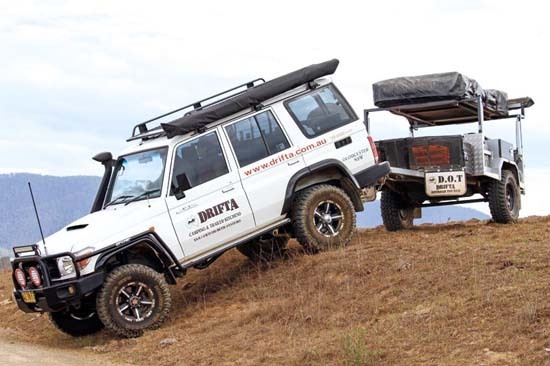 Luke Sutton believes it is the perfect touring set-up, and if you’re inclined to agree with him, the Drifta Offroad Tourer is for you. The full version of this review appeared in Camper Trailer Australia #75, April 2014. Why not subscribe today for the latest camper trailer reviews and travel features. Search for used camper trailers for sale. Search for new camper trailer for sale.